Strauss, S., Rupp, S., & Love, T. (Eds.). (2013). Culture of Energy: Power, Practices, Technologies. Walnut Creek, CA: Left Coast Press. You do not even have crack its spine to correctly anticipate its contents. The cover of Cultures of Energy: Power, Practices, Technologies features anthropomorphised electrical transmission towers across lush hills and plains. They suggest that energy—in the form of fossil fuels and electricity—gives shape to modern human life. This collection of sixteen theoretical and ethnographic accounts bridges the gap between culture and energy systems. This book’s global but narrow scope will expand your notion of energy and bring visibility to the often invisible energy sources that we rely on daily. 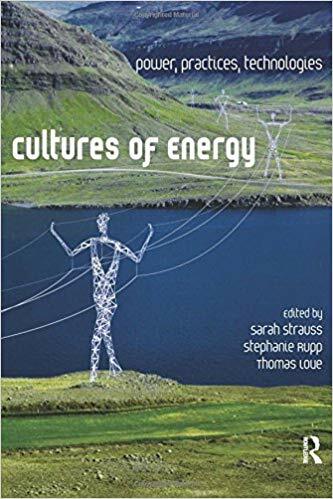 This book, edited by three American anthropologists, “explores cultural conceptions of energy as it is imagined, developed, utilized, and contested in everyday contexts around the globe” (p. 10). From pointing out the many interpretations of the notion of energy in New York, to observing how communities in rural Peru finally feel connected to the world through electrification, to viewing coal mining as a culture and a livelihood in Wyoming, and to revealing conflict in the Gulf of Mexico over deepsea oil drilling, this book delves into the myriad ways that ‘energy’ interacts with cultural, economic, and political systems. The book is well-structured with an easy-to-read tone. It is divided into five thematic sections, which offers a cohesive structure and flow to the compilation. A casual “conversation” between the authors concludes each section to highlight key points. Together, these features would make for an excellent undergraduate or graduate level resource, as the book can be read out of order, used for selected chapters or topics, or could be quickly grasped using the conversation pieces. Courses in anthropology, sociology, or science technology studies could draw from many implicit themes within the book, such as the (im)materiality and (in)visibility of energy. The other benefits (and weaknesses) of this book involve its scope. First, this book’s use of ethnographic accounts creates a contemporary focus. In regard to the interplay of energy and culture, the authors do not focus on how we got here, where we are going, or what we should do. Instead, its stories are largely about right now. This allows the readers to gain an in-depth snapshot of the multiplicities of energy and their affects today, but while sacrificing historical context to get in all that detail. Similarly, the book aims for a global scope but falls short. First, out of sixteen chapters, six focus exclusively on topics within American borders, and four more largely involve American relations o=r western perspectives. Thus, the authors’ global focus takes a western turn. Unfortunately, they skip out on Asian countries entirely. Finally, the ‘conception of energy’ used in this book stems largely from fossil fuels and renewable energy technologies. Although they address a diverse range of sources—wind, biomass, oil and gas, and coal—this scope is narrowed again by the contemporary focus. In comparison, Ian Morris’ How Human Values Evolve: Foragers, Farmers, and Fossil Fuels (2015) offers a historical look at how energy has shaped human values. Unlike, Cultures of Energy, Morris applies a more general conception of energy, where energy comes from foraging,agriculture, and fuels. Although Morris’ macro-theorizing is quite grandiose compared to the well-focused insights from Cultures of Energy, these two books are not in contest. Rather, they would pair nicely for a more well rounded understanding of energy and culture. Overall, Cultures of Energy’s narrow focus best allows readers and students to expandt heir understandings of energy as it plays out today from a western perspective. It will be sure to spur conversations by making visible one’s own daily interactions with energy systems. Moni Holowach, University of Alberta, Canada.